Taking steps to lower your risk of flare-ups is important because the effects of a flare-up can be significant and long-lasting. Average recovery time is approximately two weeks and researchers have found that people who have frequent flare-ups are more likely to become housebound. In addition, about 25% of people who have a flare-up do not respond adequately to the initial treatment and experience a relapse within 30 days. Smoking cessation support: If you smoke, quit. Talk with your doctor to find an approach to smoking cessation that works for you, whether that’s joining a support group, using nicotine patches or gums, prescription medications, or a combination of these approaches. Taking part in a pulmonary rehabilitation program: These programs include monitored exercise sessions where you’ll also learn breathing techniques, get nutrition and physical activity guidance, learn about using supplemental oxygen, if needed, and get advice on how to avoid triggers that can make a flare-up more likely, such as pollution, dust, and colds and other infections that can cause inflammation in the lungs. 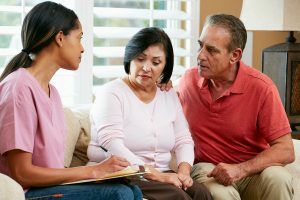 See your physician regularly, even if you’re feeling well: As part of their revised recommendations for reducing the occurrence of COPD flare-ups, the American College of Chest Physicians and the Canadian Thoracic Society advise seeing your lung specialist on at least a monthly basis to monitor and manage your condition. Guard against respiratory infections: If you have COPD, you’re at an increased risk of respiratory infections. To lower the risk of infections that can affect your lungs and reduce your risk of flare-ups, talk with your doctor about getting yearly flu and pneumonia vaccines and whether you need a pertussis vaccine. It’s also important to wash your hands regularly or use hand sanitizer when you can’t wash your hands and avoid contact with people who are ill with respiratory infections. Stay hydrated: Drink about six to eight eight-ounce glasses of non-caffeinated beverages a day to thin the mucus in your lungs. Eat a healthy diet and be as active as possible: Eat a diet that includes lean protein, whole grains, fruits, and vegetables. Avoid foods high in sodium, which can cause fluid retention and make breathing more difficult, and those that can cause gas and bloating, which can also lead to breathing problems. Talk with your doctor about what types of exercise are safe for your specific condition and how often you should exercise. Reduce your exposure to outdoor and indoor air pollutants: Check the air quality index and use air conditioning and keep windows closed on poor air quality days. Avoid indoor air pollutants such as dust, mold, mildew, smoke, and pet dander, which can irritate your lungs. Swap chemical cleaners and their irritating fumes for natural alternatives such as white vinegar and baking soda. In addition to working with your doctor, a health advisor can be another valuable resource. An advisor can connect you with experienced pulmonologists as well as other specialists and resources that can help you manage COPD more effectively and reduce your risk of flare-ups.